Art by Nicole Macdonald from her Detroit Portrait Series. Indeed, Bill Harris writes. As a writer, he continues to evolve almost beyond words. 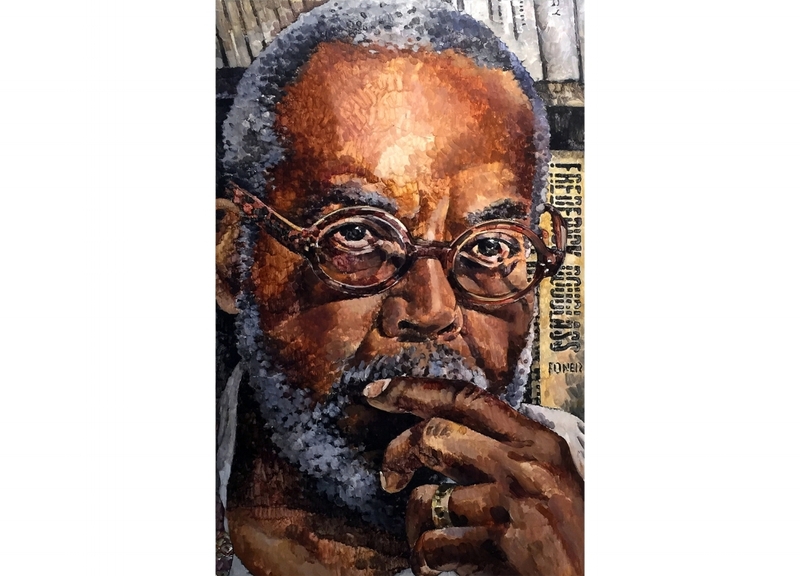 He is a poet, playwright, arts critic, a Wayne State University emeritus professor of English, an imaginative investigator of jazz, blues, culture, Detroit and the bridges in between. Harris received the 2011 Kresge Foundation Eminent Artist award. He has published three books with Wayne State University Press: I Got To Keep Moving, 2018; Booker T. & Them: A Blues, 2012 and Birth of a Notion; Or, The Half Ain't Never Been Told, 2010. His plays have had more than 100 productions nationwide. Stories About the Old Days, which starred the late jazz singer Abbey Lincoln, and Every Goodbye Ain’t Gone, with Denzel Washington and S. Epatha Merkerson as its leads, premiered, along with several others, at the New Federal Theatre in New York. Queen of Sheba, and BOO! A Musical Fantasy had their debuts at the St. Louis Black Repertory Company. Harris has also had two books of poetry published: The Ringmaster’s Array, poems honoring visual and musical artists, and Yardbird Suite: Side One, a collection about the life of jazz musician Charlie Parker, which won the 1997 Naomi Long Madgett Poetry Award.